Jackson pretty much epitomizes the quintessential mountain town. Access to this Wyoming outpost is fairly easy, thanks to a handful of direct flights across the country, including New York, LA, Dallas, and Atlanta. But when you arrive, you’re much closer to two banner national parks than you are to pretty much anything else—save the world-class Jackson Hole Mountain Resort, which boasts some of the best skiing in the country. Yellowstone sits about 130 miles north of Jackson Hole, and Grand Teton National Park is so close it feels like the vertiginous granite peaks the define the park grow right from the town square. Outdoor opulence abounds—the afore-mentioned skiing, as well as rafting, fishing, mountain biking, hiking, backpacking, and damn near anything else you can do in nature. But, until 2015, the one thing Jackson lacked was its own distillery, which some outdoor enthusiasts would rank as just as important as easy access to the backcountry. Enter Jackson Hole Still Works, the first spirits distillery in the region. Or at least the first legal one. Founders Travis Goodman and Chas Marsh started with a Kickstarter campaign, and soon founded their distillery just two miles outside of Jackson. Inspired by the rarefied, high-elevation air and acres of nearby farmland, they call themselves a “grain to glass” distillery—meaning all the ingredients are sourced locally. They also lean into the western heritage of hard work. Each batch of their limited-run spirits are hand-crafted with Wyoming grains and mountain water, and bottled with a handful of friends in what is probably the rowdiest assembly line in Wyoming. The spent grains are donated to a local farm for animal feed, and they use a heating/cooling system of recycled water as part of the distilling process. Even their labels tap into the local scene. The distillery hosts an annual contest among local artists and the winning artwork becomes the label for their signature Highwater Vodka. The artist also nets $2,000. In addition to the Highwater, they also produce Great Grey Gin, a modern twist on a London Dry style that uses a mix of steeping and grain infusion, whose botanicals are hand-ground in a mortar and pestle. 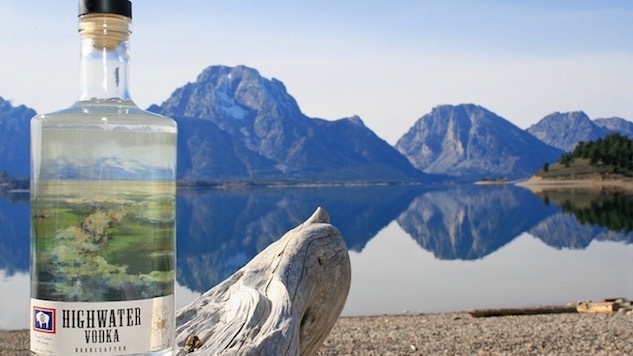 Where the vodka is as crisp and clean as the waters of the Tetons, the gin carries a delightful array of spicy notes perfectly suitable for a G&T or a Negroni. They also recently acquired 12 barrels from the region to start barrel-aging the gin and, eventually, whiskey. Those who visit Jackson—and, I’ll just say it, everyone should—will find their spirits easily. Distribution is robust throughout the state as well as parts of neighboring Idaho, and one of the town’s liquor stores will ship it your way (their website offers details). And, unlike more mass-market distilleries, the tour offers a personalized insight into the craft, as well as a chance to score one of the branded copper mugs after you have a Moscow Mule or two. Hang with the founders, and maybe schedule to take a few turns with them. After all, it’s their love for the outdoors that brought them to this prototypical mountain town in the first place.